I LOVE chocolate. The taste, the health benefits and the way it feels when a rich, delicious piece melts in my mouth and makes the sides of my throat tingle with its deliciousness – so many reasons to love it. But since I follow a paleo diet, I try to avoid sugar, so I had to find a way to enjoy a chocolatey flavor that was sugar-free, and mostly paleo. Then I discovered these guys – they’re frozen, chocolate banana bites that are packed with coconut oil goodness, raw cocao and bananas, so if you’re trying to make sure you eat enough coconut oil, this is a great way to help. Because coconut oil melts at room temperature, keep these in the freezer and take out one or two when the urge hits, let it defrost for a few minutes and enjoy. Remove from tin and place in frozen ziplock bag for storage. Last night while browsing some of my favorite Facebook pages, I ran across this recipe on Primal Fitness Performance’s page; another version of the quick and simple, grain-less lunch option for our kid’s lunch boxes. I love the simplicity of the recipe, and it reminds me a bit of the sushi roll I posted about recently! The salt of the cucumber pairs well with the creamy avocado, and while the original recipe calls for shaved turkey, you can also substitute shaved chicken, or beef. Keeping it vegan? Go with humus and sliced bell peppers, or perhaps some puree’d beans and sprouts. In case you missed our last post on how to keep your child’s lunchbox grain-free, you can view it here and see how we suggest using sliced apples in place of bread. There are so many smart options for going grain free these days, taking gluten-free to a new level. Remember, gluten allergies often go hand in hand with other grain sensitivities so if you’re trying a grain free diet to help heal your gut, this is a great option that lets you still pick up your ‘sandwich’. Please share your ideas for grainless sandwiches with us in the comments below, and remember to always live inspired! First, peel your cucumbers - you can leave a tiny bit of skin on for the added texture if preferred. Cut the cucumber in half (not lengthwise!). Next, with a sharp paring knife, make an initial indentation lengthwise and start cutting the core of the cucumber out, creating a hollow log shape out of the cucumber. Next, core and slice your avocado in quarters. 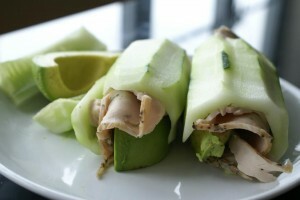 Layer the turkey in the cucumber and place the avocado in the turkey. Voila! You have yourself a fresh, paleo snack that’s refreshing and delicious! Feel free to add some basil or other herbs to add more flavors. So, since it looks like it’s a sweet kinda day, I’m posting a few recipes today that help me get past the sweet tooth urges and keep us happy when those cravings hit. I’m dairy free for a food allergy, though if you’re following a Paleo/Primal diet than you too are avoiding dairy, and if you’re like me, you may be missing that occasional bowl of sweet, creamy ice cream or sherbet. 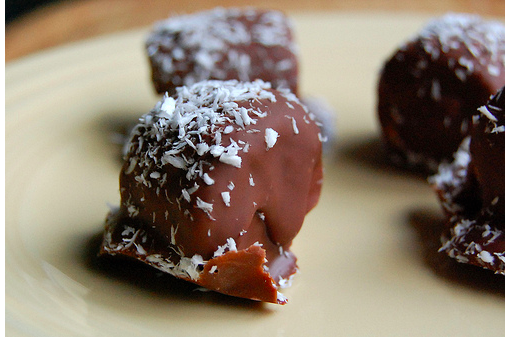 So read on for a quick and easy recipe for a delish dairy free version. 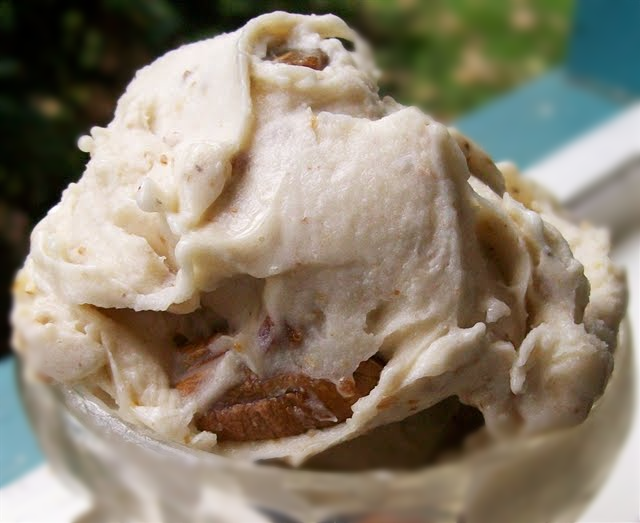 And if you’re lucky enough to live in Austin and have discovered Lick Ice Cream Parlour, than you know they have some amazingly tasty vegan ice creams, and since this one below isn’t vegan, I’ll be sure to find one that is Vegan to post soon! It’s amazing to have local options that are paleo, gluten-free, dairy-free and vegan friendly, but if you’re not lucky enough to enjoy them locally, be sure to follow us for easy recipes you can make at home to stay on track! Below is a new favorite of mine, and it’s easier than you would think. Expand your comfort zone, explore new taste pleasures and enjoy life everyday! Add light and regular coconut milk and whisk again until well combined. Transfer mixture to a medium pot and cook over medium heat, stirring constantly, until just thickened and mixture coats the back of a spoon, about 8 to 10 minutes. Let the mixture boil before removing the pot from the heat. Transfer contents of pot to a bowl and chill until cold. Process mixture in an ice cream maker according to manufacturer’s instructions then transfer to a container with a lid and freeze until firm, about 2 hours more. Note - if you don't have an ice cream maker you can use a blender on low speed, though the consistency may not be as creamy once frozen. For today’s Inspired Bite I chose a recipe from The Mayo Clinic which happens to include the nutritional details as well. While I don’t typically concentrate on those aspects as I feel like they work themselves out when you’re following a Paleo or Primal Blueprint lifestyle, I went ahead and included them in case it’s helpful. 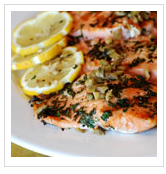 I love salmon and find it to be an easy, super healthy option packed with healthy Omegas, and while this recipe calls for lemon, I often pair mine with a mango or other fruit based side to complement the salty/fishy flavor.